A fresh and healthy fish recipe with Asian inspired flavours. The delicate seabass is baked with fresh ginger, soy sauce and chilli, then served on a bed of sesame seed Tenderstem® and a mix of soy sauce infused mushrooms and peppers. A low carb and dairy free option with lots of vibrant vegetables, which can be also gluten free so long as the soy sauce is. The ideal wholesome (and equally delish) recipe for getting back on that healthy train this January! 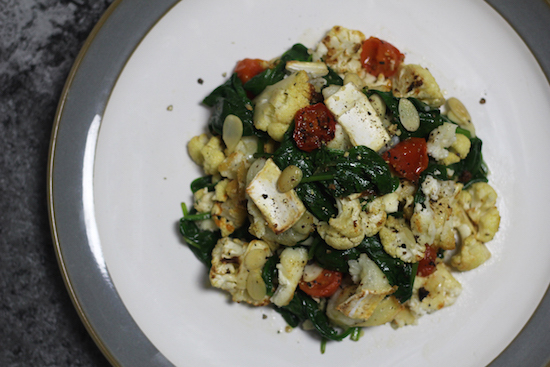 honey roast cauliflower, spinach and goat's cheese salad. A delicious warm vegetarian salad recipe that embraces sweet, honey roast cauliflower with creamy and salty goat's cheese. Toss together with roasted cherry tomatoes and wilted spinach before scattering with nutty almonds. A simple midweek meal that goes towards your daily five! The Perch Inn is just a short ten minute drive from the bustling Oxford city centre, but you'd never know it. With the River Thames within view, stretches rolling countryside and a stoney path to the door, the gastropub feels more rural Cotswolds countryside than city restaurant. This, along with the beautifully put together seasonal menu, makes for the perfect destination after a busy afternoon shopping or sightseeing. A tasty treat that happens to be dairy free and egg free too! This melt-in-the-mouth vegan shortbread recipe is scattering with coconuts and baked before being drizzled with heavenly dark chocolate. A naturally vegan sweet recipe which is perfectly bitesize. prosciutto wrapped burrata with a chargrilled asparagus, courgette and grana padano salad. A deliciously light salad which embraces the beautifully cured taste of Prosciutto di San Daniele and delicate shavings of Grana Padano cheese. The recipe calls for creamy burrata wrapped in thinly sliced prosciutto, on a bed of charred asparagus spears and ribbons of courgette. Finish with lashings of salty Grana Padano, fresh basil and a twist of cracked black pepper. Balancing fresh and nutritious vegetables with indulgent ingredients, this dish would be perfect as a simple starter or al fresco lunch. This colourful combination would be stunning paired with a cold glass of light bodied Pinot Grigio or Sauvignon Blanc.